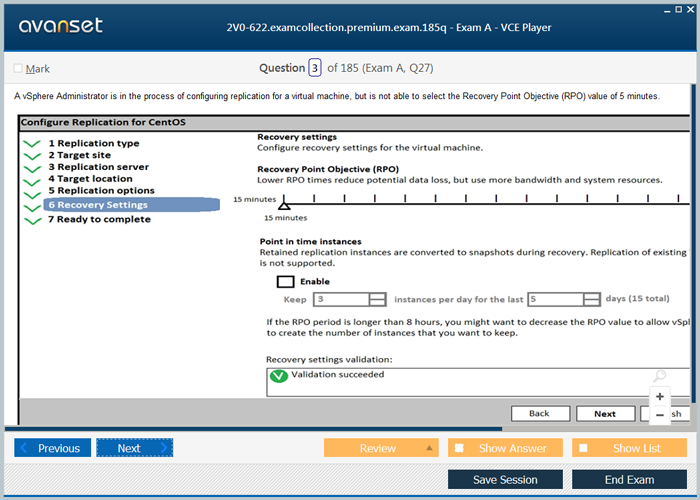 * Please post your comments about 2V0-622 VMware Exam. Don't share your email address asking for VMware 2V0-622 dumps or 2V0-622 pdf files. I want to be sure before I proceed with any purchase. I am looking to take 'Data Center Virtualization' for VMware 6.7 2019.These files are sufficient for this exam? Passed the exam last Apr. 6, dumps still valid. Used Jeremy, Karter,Andy, Banjamin and Pele. 10 new questions. Passed Today with 460 in Michigan. Used Premium. Passed today in Morocco. Pele, Neymar, Andy and Benjamin dumps are still valid! Just 5 or 6 New questions! Is it still valid in Brazil? Hi, is Karter file valid? Passed with premium, it is still valid. And i got 390 score, I-used Jeremy and Andy file. almost 20 questions are new. Any once passed with premium dump ? Is the 2V0-622 exam the same as 2V0-622PSE exam. I would like to know if am studying for the same material cos have been studying 2V0-622 exam? Premium dump is valid.3 New questions.Andy,jeremy,ben,pele can also be used to pass the exam. Premium dumps is valid. Two new questions. The answers have a different order! Is Andy,pele,Ben,Jermy dumps sufficient to pass the exam? Passed yesterday thanks to the premium dump. Passed today 440 using premium, also you can use Jeremy, Andy, Ben and Pele to pass with ease. 70 questions, no new questions. Hi Alex, Which dump have you used? 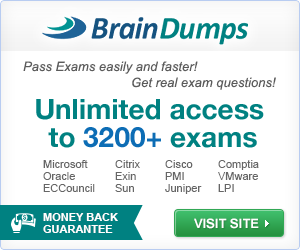 Is the free dump valid to pass the exam? Premium dump still valid. Used only Premium dump. Passed yesterday. 3-4 new questions. Is the free dump valid to pass the exam? Passed today 350. Used Jeremy, Andy, Ben and Pele... about 10 new questions. 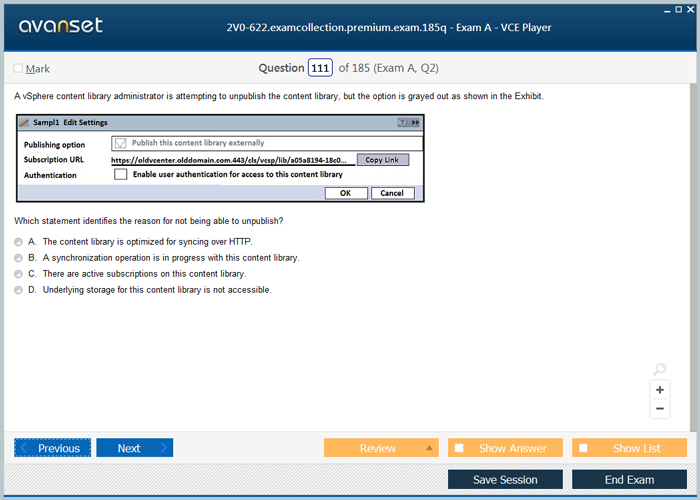 Passed today 450/500 using the premium VCE, 218 question collection. Valid. 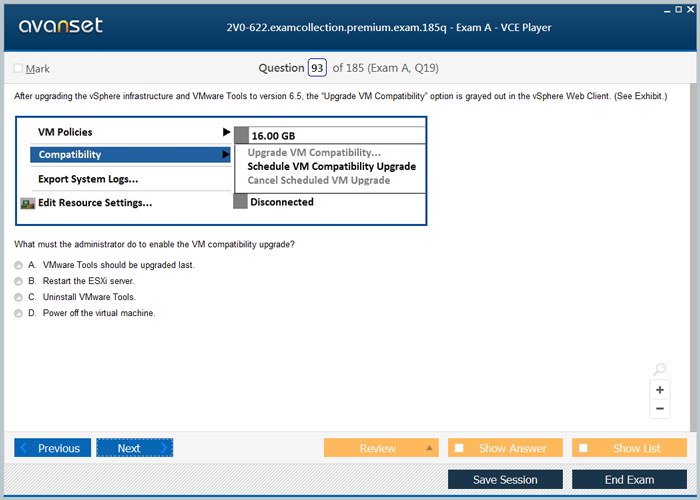 Passed today 480/500 using the premium VCE. 3 new questions. is the 2V0-622 Premium Bundle still valid? which is the file that is valid? Passed 11/13 with premium questions. 3 or 4 new questions. Premium Dumps 218Q are valid. Passed the exam with score 380 yesterday. 2 New Questions. Just passed the exam,I used the premium file there is 3 - 4 new question. The Premium file is Valid I pass today 480/500 thank you. 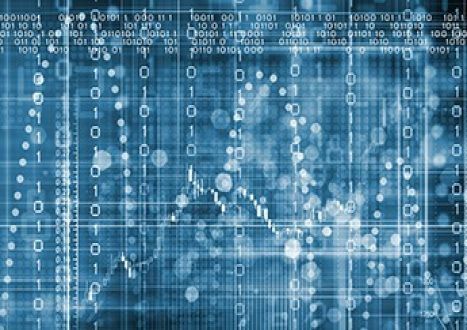 Which Dump Valid and can study it ? May I know how many questions in this vce? Premium dump still valid as of 10/1/2018. Only saw 4 new questions not in dump. Passed 490/500. Yes the examen is still valid, i passed the examen last week. guys, is it still vaild? or 2018-07-28 dump is still vaild? The dump exams is still valid. Hi Guys, once I buy the premium vce file do I still need to buy the player? 2. Configuring the VM adapter gateway, what two you would use? 3. Something about VM NUMA, and how you can determine which NUMA or such (i think i failed this question). I passed with 490, and only had 70 questions. Premium dump is still valid. Passed with 490 today . 9 new questions. Guys what’s the name of the file with 185 questions. CAn someone pleae poste the file name here? I passed the exam today 11/Sep/2018, the dump with 185 Questions is valid :). 7 New Questions out of this Dump. 2. Three Benefits of Maclearning ? 3. Secure Boot Option, what not found in Vm, what is the cause? Dump is Valid. Passed 09/09/2018. 12 Questions Out of this Dump. Is this dump still valid ? I've just failed my exam on 7 Sept 2018 last Fri. Was studying 350+ questions from another website, which might not be updated, as there are many new questions. As I can see on other sites, there is updated dump with 205 questions. Is there any chance to update this premium file or this is the latest valid dump? Thanks! 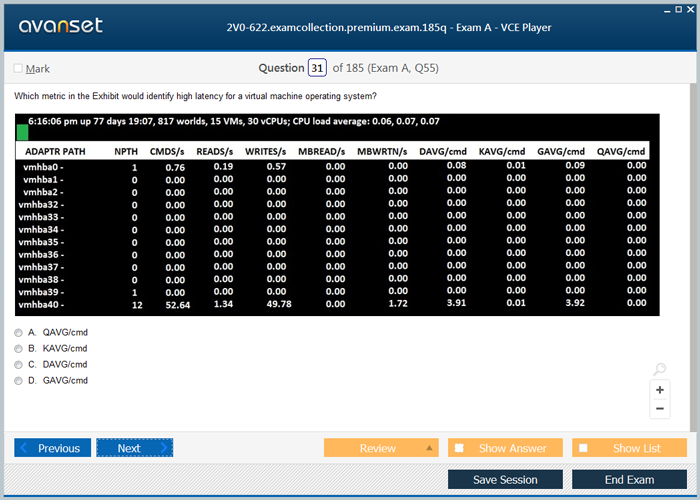 Premium dump is still valid, passed with 390 on 11th Aug. Found 10 new question in exam. 2-3 questions are from user and group permission. Hi All, Passed last week, few questions were from out of dumps. Premium is valid. From where I can get this file? Is the premium dump still valid ?? VMware VCP6.5-DCV 2V0-622 VMware Certified Professional 6.5 - Data Center Virtualization exam dumps & updated practice test questions to study and pass quickly and easily. 100% Free Real VCP6.5-DCV VMware 2V0-622 VMware Certified Professional 6.5 - Data Center Virtualization practice test questions uploaded by real users who have passed their own exam and verified all the incorrect answers. VMware VCP6.5-DCV 2V0-622 VMware Certified Professional 6.5 - Data Center Virtualization practice exam dumps & training courses in VCE format in order to pass the exam. 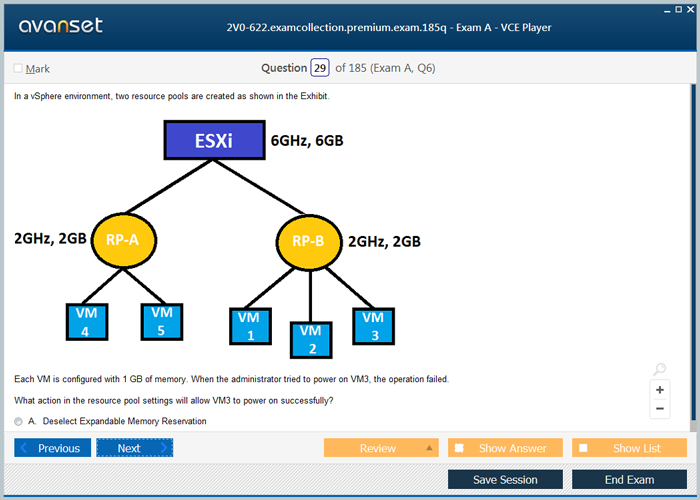 You need Avanset VCE Exam Simulator in order to study the VMware VCP6.5-DCV 2V0-622 exam dumps & practice test questions.